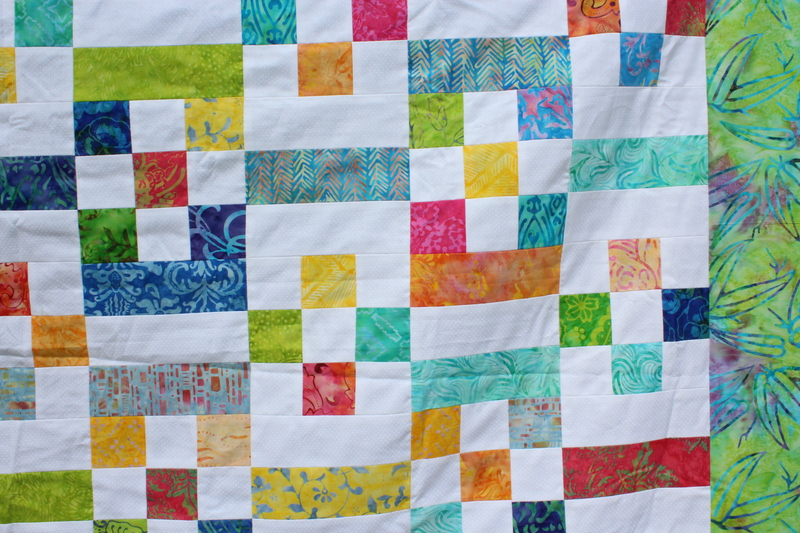 Quilt tops and a new camera! So, as a wedding/birthday gift, my dad bought me a new camera! It is a Canon EOS Rebel, and I have to say, so far it is one sleek piece of technology. I’m not very technology savvy; I know how to change out lenses and how to zoom and focus, but that is about the extent of my photographic abilities. But this camera makes it easy. It comes with two lenses- a 18-55mm, and a 75-300mm. (Basically, for those of you who, like me, read that last sentence and go “Uhh, what?”, it’s a short lens for closer photographs and a long lens for objects farther away.) It’s been super fun to work with. Not quite a point-and-shoot deal, but VERY close. And, since I now have a new camera, I am able to take pictures of some of my quilt tops for y’all! Not all of them, since we are currently up in Michigan visiting with family and friends, as well as going on a family vacation up in Traverse City. 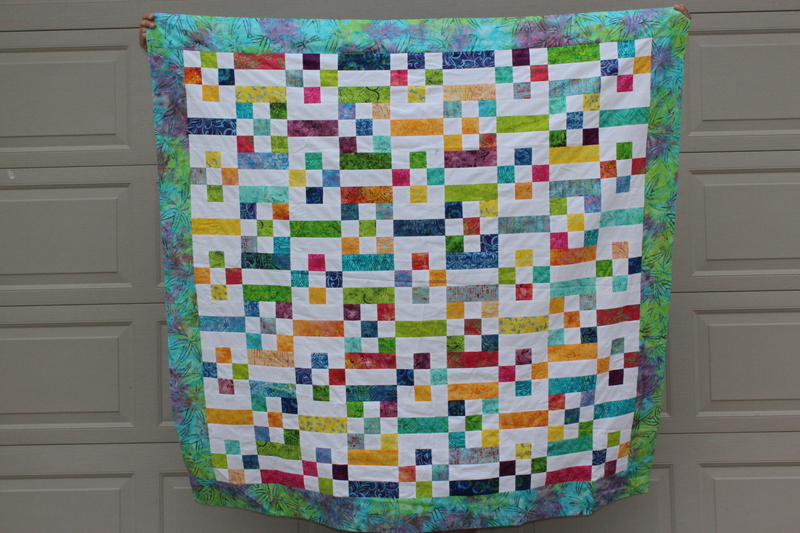 The first one is the second quilt top I have ever finished- I saw the kit in the local quilt store and instantly fell in love with the bright colors. I know I’ve included a picture of it in a previous post, but that was with my 4yo cell phone camera, in a dark apartment, so you’ll be able to see this much better now! I dragged my husband outside to be the official quilt holder- he had a bit of fun with it. The second quilt I made during a class I took, again at my local quilt store. I had been eying this fabric collection for several weeks, and the class gave me the perfect excuse to try it out. 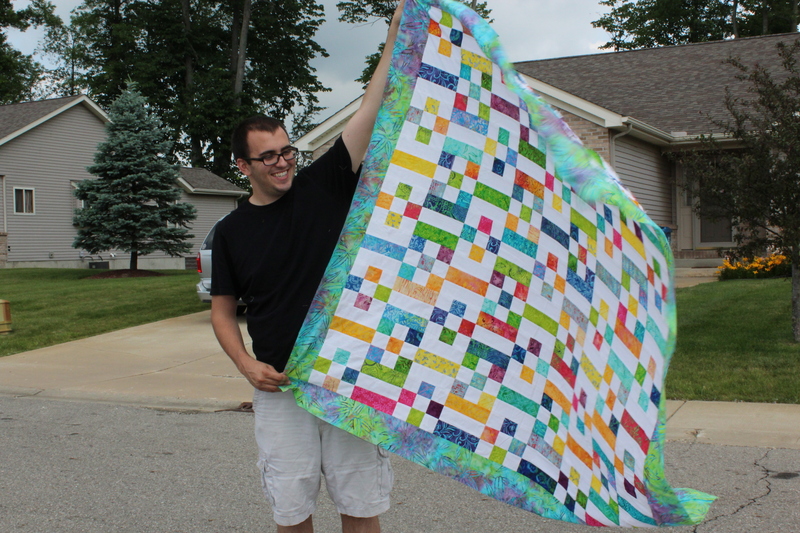 The pattern is made by simple square blocks, 9 patch blocks, and rail fence blocks. It was a ton of fun to put together, and it gave me some practice with pressing seams to one side (usually I press them open) and working with my corners! 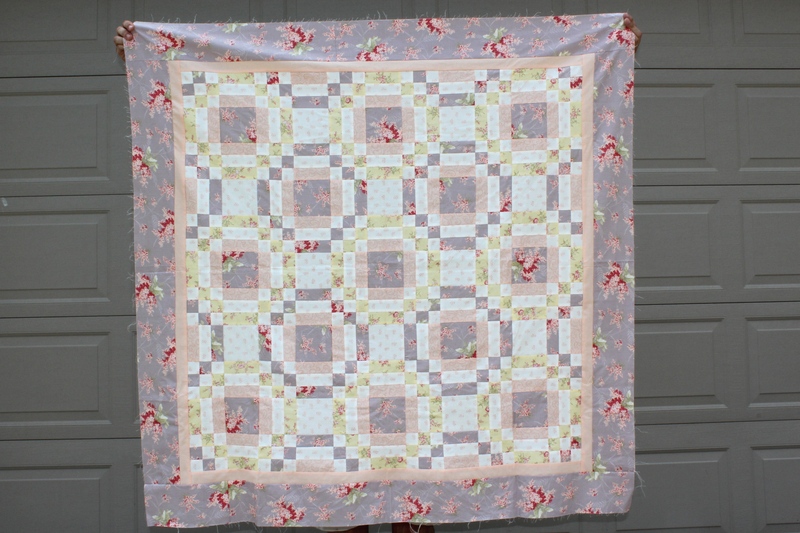 I’m currently working on finishing up a Farfalle quilt top using fabric from the Ambleside collection, as well as a quick and easy one-night baby quilt using a charm pack. The problem is, since I’m up in Michigan I do not have access to any of my sewing materials. This is where I leave you for the day, but I will also leave you with a picture of my husband proudly flying the quilt flag of the drafted helper! Have a wonderful Father’s day; enjoy your week!